Malcolm Byrne tells CSPAN2 “There are virtually no heroes” in Iran-Contra Scandal. 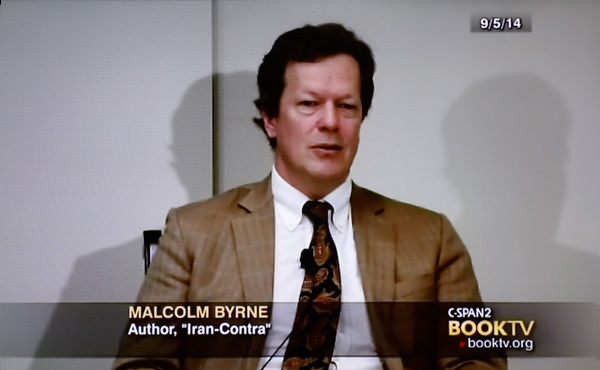 Malcolm Byrne appearing on C-SPAN2’s BookTV, September 21, 2014. National Security Archive Deputy Director Malcolm Byrne recently discussed his latest book, Iran-Contra: Reagan’s Scandal and the Unchecked Abuse of Presidential Power, with the Brookings Institution’s Bruce Riedel, who wrote the book’s foreword, and CSPAN2’s BookTv. 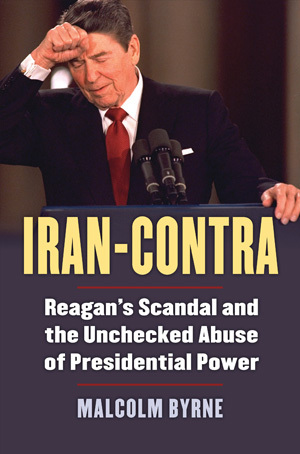 Iran-Contra utilizes tens of thousands of pages of previously classified materials to describe in detail all the administration’s decisions and actions, and discusses the rationales invoked at the time as well as after the fact. Byrne’s is the first full-length account of the affair to study not only the affair itself but to assess the various official investigations that were convened — the Tower Commission, the joint congressional hearings, and the independent counsel’s inquiry. Byrne ultimately concludes that the affair could not have occurred without awareness and approval at the very top of the U.S. government. He reveals an unmistakable pattern of dubious behavior — including potentially illegal conduct by the president, vice president, the secretaries of state and defense, the CIA director and others — that formed the true core of the scandal. When analyzing President Reagan’s role in the scandal, while acknowledging the story is a multilayered one, Byrne says, “I see Reagan as being the driving force behind the scandal, both elements of the scandal.” Byrne goes on to say Reagan provided the guidance and cultivated the atmosphere that allowed members of his administration, including National Security Council staffer Oliver North, and National Security Advisors Robert McFarlane and John Poindexter, to act as they did. To help answer another multilayered question, Byrne notes that Reagan’s emotional attachment to the hostage crisis characterized his response. Of additional importance was David Kimche, Director-General at the Israeli Ministry for Foreign Affairs, approaching McFarlane in late spring of 1985 with a message from Israeli Prime Minister Shimon Peres. Kimche said Peres and the Israelis were willing to help the U.S. in understanding the new Islamic Republic of Iran if the U.S. wanted assistance. One of the ideas floated in later discussions with the Israelis was that selling Iran, then nearly five years into the Iran-Iraq War, U.S. weapons would be a valuable demonstration of American good faith. 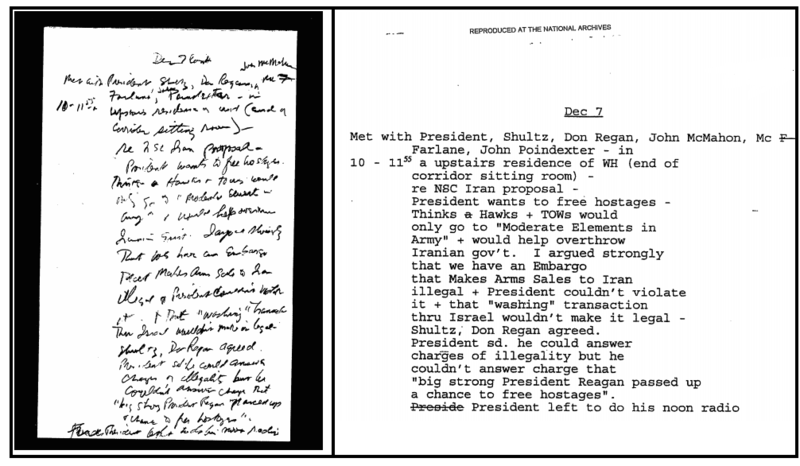 The idea of selling arms to Iran became a reality when Reagan met with McFarlane in the summer of 1985 and began discussing the arms trade in earnest, with Reagan eventually telling McFarlane, “let’s do it.” Both Secretary of Defense Caspar Weinberger and Secretary of State George Shultz acquiesced to the possible opening; each telling McFarlane, in effect, “it’s OK by us, go ahead and pursue this,” albeit with caveats. Casey’s role in the scandal was critical. Within months of taking office after Reagan’s election he had sent draft Presidential findings –which authorized covert action– on Iran, Nicaragua, and El Salvador, to the President’s desk; these findings ultimately formed the groundwork for what was to come. Visit here to watch the entire CSPAN2 BookTV interview, and here to read some of the many declassified documents cited in Iran-Contra.